Thread will be unlocked as soon as the comic is released. Dark Horse announced that Turf Wars, Part 2 will be physically available from January 17, 2018 in bookstores and can be bought online from January 30, 2018. You can pre-order the book on Amazon. Turf Wars is written by co-creator of Avatar: The Last Airbender and The Legend of Korra, Michael Dante DiMartino, and illustrated by Irene Koh with feedback from Bryan Konietzko, the other co-creator of the series. This thread is for opinions & discussion about the story. A thread for professional reviews will be created in due time. For questions on release dates and buying the books, see A:TLA & TLOK Graphic Novels in the Marketplace. For speculation of Turf Wars, Part 3 and other future comics, please see Turf Wars, Parts 2 & 3 – Speculations thread and Official Avatar Comics News thread. The comic is out in bookstores. Remember, only post if you've read the comic. As usual, illegal links/scans are NOT allowed to be posted and all forum rules apply. Well than first of all using the Avatar's girlfriend as a hostage, last person to do that was General Fong, and things didn't work out for him, so good luck with that. I wonder if the elections will be settled in part 3 or this going to be an on going plot. I don't hink Zu Li is a shoe in to win, let's not forget Verrick's past, and how much Zu Li helped back than, you don't think Raku and his sleazy campaign manager is going to use that, you are nuts. So this is going to be a nail bitter. I hope Jargala gets to do some cool stuff in part 3, I like her. Next comic, we got to go to Fire Nation, I have to see the place, also want to meet Izumi's daughter and Iroh's sister. And maybe see Kiyi if she is still alive. I know we won't see Azula until we settle her character arc in the Avatar comics, so they not going to spoil us on her fate. But if we get to see Kiyi I am happy. - I like Jargala's design! Also, I like the addition of a female triad member (I don't recall any in the show). - I find it funny that they put a dramatic picture of Asami on the cover, considering she a) gets less page time than Mako and Bolin, and b) doesn't actually participate in any of the action. - Korra suddenly being really interested in Asami still feels disconnected from the show. (Like, in the finale, when Asami and Hiroshi's mecha is in danger, they don't focus on Korra's being particularly worried or anything.) Their dynamic is still pretty boring though, so I guess it hasn't changed that much since the show. - I guess they're going to make the turtle-duck date night picture canon? - Korra says she cares about Asami more than anyone else. Korra... you've been dating for like, two days? - Mako doesn't have a burn scar I guess. - Yay, someone addressed the fact that Korra went on vacation while the city was still in trouble.... though it dodges the fact that everyone also attended a lavish wedding during that period. - Speaking of, the Zhu Li as president thing feels contrived. Like, people in Republic City have no reason to trust her after all the stuff she and Varrick have done. - I liked the little brotherly moment where Mako and Bolin are chatting and Mako teases him about the Nuktuk movers. - Did Part 1 include that potted history of homophobia in the Avatarverse for... no reason? I do hope they bring up Zhu Li's shady past. I would like to see the modern Fire Nation, maybe see a bit more of the royal family. Introducing Kiyi would be an interesting move, though I wonder if they'd like to keep each set of comics accessible to people who haven't necessarily read the other series. ^realistically, i'd expect a top-heavy dynasty and tons of surplus nobility struggling to stay relevant in a world that increasingly leans to les feudal and more democratic forms of government. Prince Wu announced such reformations himself, but i'd expect FN nobility and royalty have more difficulty parting with their red plush. also realistically, i don't expect this topic to be handled satisfyingly. My take after reading Part 2. - Art is still inconsistent. I agree with what Nausicaa said, but I also feel like the face structures were largely inconsistent as well. I'm talking about the expected shape, nose size, eyes. And no, it's not because some panels were shot further out than others. I'm focusing mainly on comparable panels. - "you're the most important thing to me" from Korra to Asami made me laugh a bit. Did we forget Tenzin existed and what role he played Books 1-3? Again, agree with Naus on that one. - Kind of sad Mako doesn't have lightning scars. Though his "moment" was pretty awesome. Looks like he's the designated "I get the cool moments" in LoK. Lightning Bending Amon, the way he killed Ming-Hua, blowing up Kuvira's Gundam, and now handling this explosion. - I REALLY don't like how they've made Raiko this mustache twirling evil monopoly man. It just reeks of overcompensating to make Zhu-Li look good. I'm hoping that even when Zhu-Li wins, that she will understand the pressures Raiko was facing and actually go AGAINST Korra at times. Otherwise, it will feel like Korra is always "right" and has a bunch of "yes-men" around her (Tenzin rolled over rather quickly). - Still don't understand why Spirits are being absolved of the fact they tried to be freeloaders in RC. - I'm guessing Asami will rescue herself, because it was alluded to earlier how she can take care of herself. Plus, when you have some old man kidnapping you, she's bound to pull something off. With that being said, the damsel in distress trope...whyyyyyy. Were this a MxF pairing, people would not be liking this one bit. - Next issue looks like it's going to be pretty rushed. On the bright side, I think the plot is now gonna have The Bending Bros and Korra's storyline to converge so the two groups are no longer separated, meaning we don't have to spend time on two different plot lines. I imagine the Spirits will make some important appearance during the final battle, Zhu-Li will win her election, and everything will end with that turtleduck boat romantic scene. - Also, did anyone notice some of the refugees wearing hijabs? That came out of nowhere. It was I believe when Raiko and Korra were talking. ^ Irene mentioned before Part 1 that she wanted to portray more characters from other parts of Asia, hence you have characters wearing the Indian sari and the Korean hanbok (Song from ATLA wore it too) in Part 1. So I’m not surprised if there are hijab wearing characters in Part 2. After all, ATLA & TLOL draw heavy influences from real world Asia. - Also, did anyone notice some of the refugees wearing hijabs? I'm fairly sure they are simple head scarfs. They are supposed to be quite fashionable (and practical as I heard it) among women up until the modern times. And I mean "modern times" as "80s and onward". Whose land was that first? Well, I'd agree with you, but as Icy mentioned, we have the leader of the Creeping Crystals dress in Indian clothing. Furthermore, the one who is wearing a "hijab" happens to be brown skinned as well along with the fact she's just not wearing a head scarf, but also has a white layer underneath to hold her hair in place, which is customary for women wearing hijabs. I think that's pretty irrelevant given it's been thousands of years at this point. Besides, it's not like they were having a population or resource crisis back "home". Which, on another note, it does make me wonder how the Spirits "lost" to humanity once Wan became Avatar. For all intents and purposes, we've seen the negative spirits manhandle humans. Perhaps they respected Wan more than they respect Korra (the person who manhandled Vaatu and instead of sealing him in the Spirit World locked him away inside of Raava.) Wan told them to leave and they left, vines too except for those in the Swamp. Meanwhile Korra told them to leave and they told her they couldn't. If Hei Bai and Wan Shi Tong (or even Raava and Vaatu) are any measure then spirits are really stupid when it comes to fighting. They have raw power, but not the wits to use it properly. Just got around to reading Turf Wars part 2. It seems like Koh's line work is getting worse, especially in the faces, but there are other issues like character positioning and different line sizes that really stand out. I'm not sure if it is a problem of crunch time or something else. The story has all the problems that cartoon has and then some. I really don't have anything else to say. I'm not sure if it is a problem of crunch time or something else. Koh: "Process-wise, other than crunch times near deadline, I try not to work more than 4 hours a day, and I take a lot of breaks (having a needy puppy helps with this, lol). I also ask for what I'm worth when it comes to rates, and I am very upfront about how long it takes me to get certain work done." I'm not really invested. Then again, I wasn't really much into LOK either. Jargala Omo's design reminds me a lot of Esmeralda from the Hunchback of Notre Dame, which is a'ight. The panel where Korra punches her palm and threatens to beat up Jargala was unintentionally hilarious. She has the angry anime veins on her forehead to convey that she's angry, but looking at her face, there's almost no emotion. The sketchy inconsistent character art can be jarring, but what bothers me more than it should is the interior designs of the rooms. Asami's little caravan has a desk in it, and some papers, and a little bin that she keeps next to her door far away from her desk. Which means that every time she discards a design, she has to get up and walk to the bin, and she's doing these designs with fountain pen so you know she's throwing them away in droves. Who can be bothered with that? Is Asami even human? Lady, put your bin next to your desk! You have literally three pieces of furniture in this entire caravan, bin included - why is it all the way over there? Also, why is everyone suddenly so averse to wall decorations? Paintings, scrolls, wooden paneling, doodles on the walls... anything? Looking back through the comic, there's so many scenes where characters are just sat around spouting exposition in barren rooms. Peach/pink/grey/orange backgrounds, and occasionally we'll get a pink/peach/grey/orange gradient for some real visual stimulation. There's no life to any of these places; we have the bare minimum "place for character to sit", "place for character to sleep" and "place for character to stand around", and sometimes not even that. Zhu Li's tent has a fold out chair in the middle facing nothing... and that's it. What does she do here...? I understand that this is an evacuee camp so things will be sparse, but people don't set out stuff like this! People don't behave like this! Where are the kids playing around with junk while the adults line up for food, just in the background, to make me feel like these citizens actually exist in this place with lives outside of "they're here for this scene now since the plot requires they be here." Overall, I'm really not feeling these. Huh, looks like Mako's arm doesn't have a scar. Guess a lot of cool fanarts will no longer be relevant. So he can move the arm but he has to put it back into the sling because... it's not fully healed yet? Didn't realize Keum means "gold" in what I assume is Korean. I only knew it was gold thanks to the bilingual bonus translation that was on the outside of his building. And lol Zhu Li wears the pants in the relationship for sure. 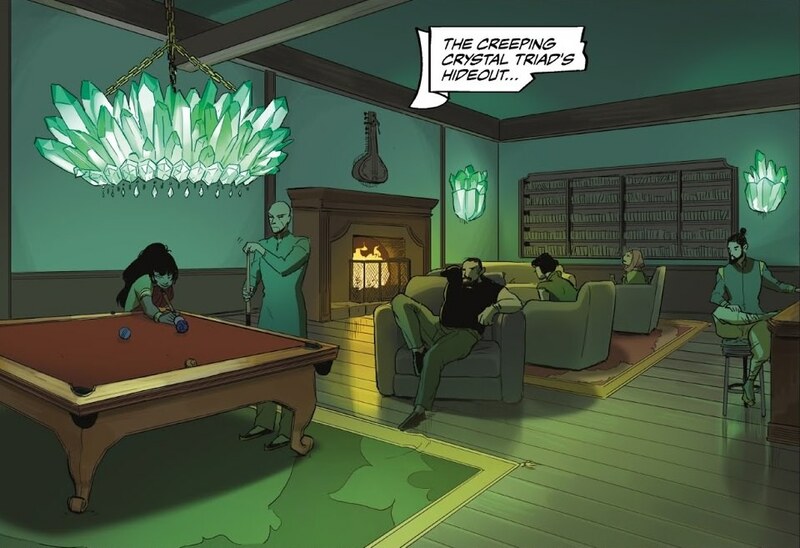 Gotta like the reference to a certain wall in the comic. I also liked the design of using Chinese words instead of numbers on the clock tower. Of course, we've seen that used on the police radio in the show so I shouldn't be too surprised. Finally, someone has criticism of Korra going on vacation at a rather dire time. Something that the fandom pointed out a long time ago. Why are we still recycling the damsel in distress trope again? I know Asami is skilled enough to be able to gain the upper hand and throw the guy who's holding her off the airship. Please let that happen. Please don't let her fall off the airship and Korra has to rescue her again. We know Asami is able to hold her ground. I'm still not a fan of the art. There's way too many stray lines and shadows. I find it very distracting. 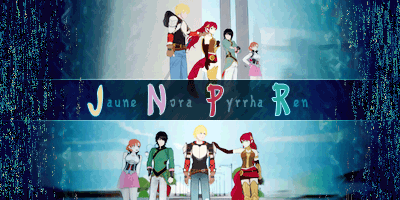 While Gurihiru's art was cartoon-ish, at least it was still neat and rather clean. Story wise, it feels like we're still climbing the mountain and have a long way to go to reach the peak even though it's Part 2 of the tale. I got a feeling Part 3 may be rushed. Unless Mike surprises everyone and ends it on a cliffhanger that carries on to the next trilogy, if there is one. I find that Mako has no scarring kind of surprising, given his arm literally got burned by his own lightning...which should result in scarring regardless. I mean, it's only been at most two months since he got hurt? Unless he got some water bending voodoo treatment to heal his scars. And while I was excited to see Raiko criticize Korra regarding her impromptu vacation, I'm just going to assume it's gonna get swept under the rug just like how a lot of criticisms towards Korra do. Unless he got some water bending voodoo treatment to heal his scars. So Mako must have been healed pretty quickly in the aftermath by Korra or some other healer in the RCPD, if they have any. Or a generic hospital. Injuries in this series only have the tendency to stick when character development character torture is deemed relevant. I forgot this happened. I was thinking of the scene at the end of Book 2 when Aang got blasted by Azula's lightning. IIRC, he still has that scar. Oh yeah. I think Mako's injuries are slightly different? He wasn't directly struck by lightning. It's more of the lightning/equipment overheating and exploding, resulting in burns. I'm pretty sure a crew member drew an older Mako with an arm scar, but I guess that was their personal interpretation. And yeah, I'm not sure how part 3 will resolve this story without follow-up comics. There doesn't seem like there's much room for the election stuff, considering that Zhu Li only just decided to run. Yeah, I'm not a fan of how dull the backgrounds are. (I've seen other people mention it too.) Admittedly it doesn't help that a lot of scenes are set in boring places (tents, trailers) but I agree that even those could be improved. I was bothered by the depiction of the area around the spirit portal in the first book- the backgrounds almost completely omit the nearby buildings. I've finally come around to read the comic, and while I'm not impressed for the reasons mentioned by others in this topic (poor art, 'meh' story), I have one big thing that left me scratch my head: what was the big plan for the Tiberium Crystals Lady when she tried to shake down Asami? Are the events of TLOK not known to her (I doubt that) or what? The whole scene was so confusing I had to put down the comic for a few hours because I was simply unable to continue . Also, Kai screaming for help when he was attacked by those evil spirit flowers was pretty funny considering his in-show character . I've finally read the comic. I honestly believe Asami Sato may be the worst Avatar character ever (but I have a fuzzy memory), my reasons for this conclusion being the fact at least most characters before her had the decency of keeping their screen-time limited or disappearing altogether. She sticks around and yet she never stands out, and the fact these comics have demoted her to inconvenient damsel in distress instead of at least trying to give her some belated substance or/and make me care about Korrasami is pretty disappointing but not surprising. It raises the same questions: Why is Asami a member of team Avatar? She doesn't fit, she's like a dim bulb next to three shinning (if flawed) suns, so what is the point of her? The narrative never knew past Book 1 and this comic continues that trend - too bad they can't use her so-called 'brains and resources' to greater effect, considering Saito from Inception did in fact buy the airline. For the life of me, I wish they'd just kept her (from what I'd heard of the original concept) some Femme Fatale backstabber in Book 1 that disappeared with the Equalists, because at least that's a concise purpose. Now I have complaining about Asami out of my system, because I can't waste time on her, even the comic knew that, I will speak of other matters... Okay, wait... just one thing. The romance between Korra and Asami is lacking any substance and will never raise my heart above its minus 5 temperature like Maiko or Kataang or [insert Avatar relationship here]. I mean, at least Makorra annoyed me and Bopal had moments I vaguely remember, but the interactions between Korra and Asami are just so badly written (Cleverbot has more conversation depth) and just so half-hearted. 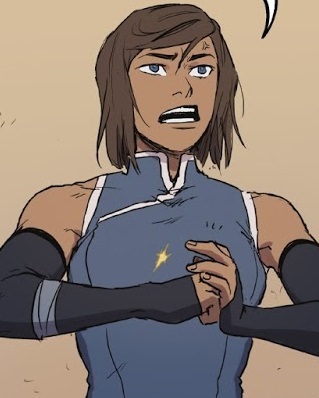 Also, I kinda feel Kya's LGBT+Q from last comic was pointless since nobody seems to care about Korra and Asami being together for that reason and uninspired since, while I can buy traditionalist prejudice, the Avatar world so far lacks religion (or any explorations of ones that might/probably exist) so we were given kinda reasons (Sozin is mean, Earth Kingdom loves tradition, Water Tribe... likes to hide things?) but they were forced and lacked depth, especially considering the history in real-world Asia - but, anyway, the info dump was pointless because the issues it brought up aren't brought up again, not even by the bad weird-looking-but-unmemorable guy who's name is Totuga or something for some 'I am really mean' cred. Anyway, besides that, the plot kinda doesn't work for me. We have the Spirits, who despite being pretty aggressive and pro-active about humans-near-portal, have taken a backseat (probably vacationing in some spiritual Las Vegas-rip-off) to a plot about a now-weird-looking guy who is the-main-baddie-so-far and has extended the parameters of being a Shanghai triad to becoming a militia trying to take over RC and battle the Avatar, which so far his mobster stooges seem completely fine with it. I get they might be afraid of what a tentacle can do, but I'd like more 'What the hell?' reactions to this whole going up against everyone, Avatar included, instead of extorting mostly-defenseless civilians - I mean, even Pablo Escobar got a few of those. I can't get into Turtogo's or whatever's-name character enough to remember his name or what his motivations, if mentioned, exactly are, but eh - at least I like his eyes. Bolin and Mako had some nice brotherly scenes, I'm semi-charmed by their antics. Raiko was okay, but they pretty much 100 percent complete his turn into typical 'nothing matters but my polls' politician, in comparison to Zhu Li who is jumping from belabored secretary to running for President (but, stranger things have happened) and played as 'the right (wo)man for the job'. The housing situation doesn't interest me too much, I feel that it's just not that well-executed, mostly because Asami (yep, and I said I was done with her... or did I?) is planning housing and yet we don't really see her thinking process or if she's doing something more interesting (not saying I find emergency housing fun, but it felt skipped over more than it should have) - we see Jargala trying to extort Asami, which is funny for two reasons - one, she's a member of team Avatar who has semi-kinda gone up against big baddies, and two, because I guess that even Jargala knows Asami's a weak link or doesn't know her at all (lol) - Okay... Asami, I'll let you be, I promise, let old grudges lie. So, anyway, Korra and A-... I mean, *cough*, Korra is okay in these comics, but not brilliant. I think we've already seen 'Korra-acts-rashly+emotions÷poor-judgment=plot propulsion', so it was kinda a retread instead of doing something interesting with the character post-series. I can't really say much beyond I wish they had her a more unique, new road to tread down for this comic. I don't want to be a Negative Nancy about it though. I feel the comic is okay for what it is, but I feel they just missed an opportunity to tell a more interesting story and do something different with the characters. I actually didn't mind Bolin being a cop since they're probably understaffed (Mako did say temporary) after Kuvira murdered their forces in a discrete-cutaway shot/off-screen, so I can buy Bolin, a pretty competent bender for this series and jobless, having a go at it, so he was pretty in character. Mako too was pretty in character and doing his job, and I've liked him a fair bit since Book 3, so it was nice, even if I wish they could give him more character-interesting-narratives... and, now that I think about it, I do question the point of bombs being effective if a decent firebender can just save everyone with pretty much no real consequence - maybe, the villains should invest in adding shrapnel to their explosives as a nice quick 'surprise'? That felt kinda like a cop-out (But, I forgive it, because I am a Positive Percy now , after all this time gone!). I didn't even mind the art style that much, it was a bit different and the previous ones were superior with detail and consistency, but it suited its purpose I believe and had nice moments. I actually didn't mind Bolin being a cop since they're probably understaffed (Mako did say temporary) after Kuvira murdered their forces in a discrete-cutaway shot/off-screen, so I can buy Bolin, a pretty competent bender for this series and jobless, having a go at it, so he was pretty in character. This gives me an idea. Instead of Korra's further Avatar drama, they should do an ongoing series centered on Bolin. Every issue would be done-in-one, and feature him taking on a new mundane job, like elevator operator or bus driver or personal shopping assistent. 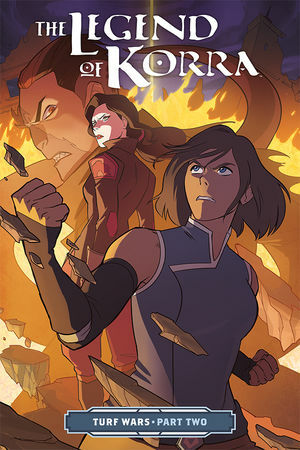 Every single issue starts off showing him as competent and capable at his new job, and we think that maybe this will be the one that sticks, but then Korra and Asami come along and either cause some kind of trouble or add some complication, and things start to go wrong, and Bolin reacts immaturely, and then things become a disaster that ends in some spectacular failure that gets him fired. Every time. And it's a slapstick-silly-comedy tone. Basically, old 'Donald Duck' comics but Bolin is Donald and Korrasami are the nephews. Maybe every so often Unca Scrooge Verick can come along and take Bolin along on a world-spanning adventure. I think that would be a more satisfying direction for this half of the franchise. And it wouldn't stress any writing muscles. We'd have to get funny art, but from what I've seen, there's plenty of people on the internet who could manage it and would probably love some paying work. Yeah, I'd read it , I think a lot of people underestimate episodic formats (Batman: Animated Series FTW). I've always felt like LOK's persisting problem was its over-ambition grinding against its writing quality/ability making everything feel like a half-measure falling short of something really interesting, so it'd and this comic probably have benefited from a simpler, entertaining storyline like that than trying to do this whole 'Korrasami-homophobia-in-Avater-but-not-really-at-all-also-annoyed-spirits-with-the-triads-turn-supervillains-with-that-weird-tentacle-guy' story that Turf War is going for. After all, often enough, less can be more. There is something in the comic that has been nagging me for a long time that no one has addressed, how on earth is the ambush that the police walk into supposed to work? I mean, in theory it’s okay, but the artistic depiction leaves a couple of logical problems. Lin uses her seismic sense to estimate how many people are in the room, and she says there are at least a dozen. But there is one rather serious problem with the illustrations of the dummies that tricked her, they don’t have any proper feet! How do you mistake something that has the foot of a coat stand for a human being? I know Toph complained about her daughters bending being imperfect, but usually its better than this. Also, why do the dummies, which by the way quite heavily outnumber Lin’s estimate, explode? We never see anything triggering or fueling the explosion. In the past we have always had some indication of how an explosive ambush happens, but not here. And please don’t say that it’s because the dummies are covered in explosive postit notes. That would not fit very well with what we have seen in the series in the past. I know enchanted pieces of paper can do all sorts of things in various anime series, but that sort of mumbo jumbo has never been used in Avatar as far as I can recall. The fact that explosive paper also reminds me of the running gag from Inspector Gadget doesn’t help either.